Sports GP Bike handkerchief in colour of your choice with a personalised name or initials embroidered. 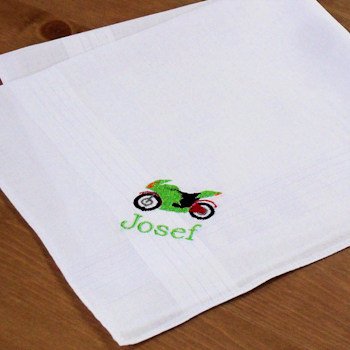 Sports GP Bike handkerchief in colour of your choice with a personalised name or initials embroidered. Select from one single hanky or a gift set of 3 handkerchiefs. Just fill in the option box with a name or initials and choose what colour embroidery thread you would like for the text and the letter font style. Sports GP Bike handkerchief in colour of your choice with a personalised name or initials embroidered. Select from one single hanky or a gift set of 3 handkerchiefs. Just fill in the option box with a name or initials and choose what colour embroidery thread you would like for the text and the letter font style. The motorcycle motif is sewn in to coordinate with the text thread colour you choose. The size of handkerchief is either mens 38cm or ladies 28cm size standard white cotton fabric. (Childrens and ladies hankies are the same size.) Totally awesome little gift for bikers!